It’s been a while since I’ve done a “Guess the Embouchure Type,” so I’m way overdue. Here is a video of the Cannonball Adderley Quintet playing Work Song. Nat Adderley’s solo starts at 2:39 if you want to skip straight to that. Although the video resolution is pretty low, I think you can a close enough look at Nat’s chops that you can make a fairly accurate guess as to his basic embouchure type. My guess after the break. A recent topic on the Trombone Chat forum has gotten me thinking some about the way the lower lip will function differently for different brass musicians. Doing a cursory search on the internet you’ll find a lot of advice that is contradictory to each other. My general impression is that most folks who have an opinion about whether the lower lip should roll in when ascending lean towards avoiding it. But there are some players who feel they do so who arguably successful players. Of course a lot of what brass teachers advise is based on what they think they are doing by feel. It’s uncommon for brass teachers, at least in the United States, to not look closely at a variety of brass players and compare what the lower lips are doing. It’s one thing to recommend what you feel works for you, but I think it’s worth taking the time to carefully observe what’s actually happening. Regular readers here and other knowledgable brass teachers will immediately know that what a player’s lower lip should be doing is dependent on the individual’s anatomy and will be different from player to player. 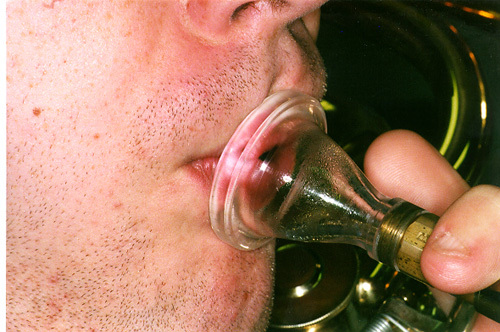 That said, you can observe particular patterns in a brass musician’s embouchure that make certain predictions about how a player’s lower lip will function when working correctly. There will always be variations, even among players belonging to the same embouchure type (intro to the three basic embouchure types). 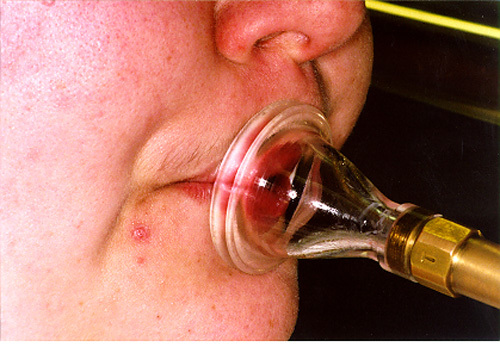 The easiest embouchure type to see the lower lip is the “low placement” type. 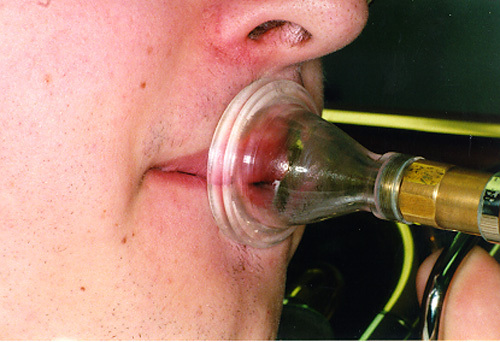 Because there is more lower lip inside the mouthpiece the lower lip vibrates with more intensity than the upper lip. 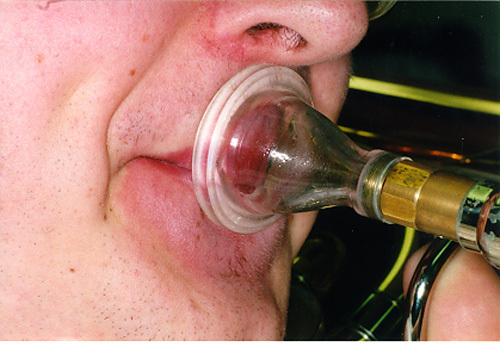 When a low placement player plays in the lower register the lower lip gets blown a bit more forward into the mouthpiece cup. As an upstream player ascends you can see the lower lip sort of flattening out, but it never really seems to roll or curl in. Now it might feel like the lower lip is rolling in to some low placement type players and that can be one possible way to make it click for students, but it really doesn’t actually describe what you see. From my personal experience as a low placement player, I used to allow my lower lip to blow out too far into the cup, particularly when I was getting tired. It resulted in some weird double buzzes. I also would have some trouble getting back into the upper register without taking the mouthpiece off my lips and resetting. 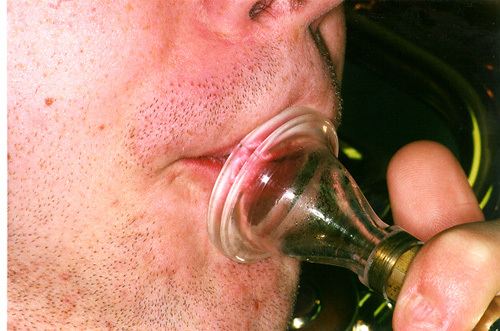 The “very high placement” embouchure types have the reverse lip ratio to low placement players. With these players you will see the lower lip rolling in, to a certain degree. I’ve also noticed these players will often bring their jaw forward slightly as they ascend, which might affect how much lower lip roll is proper for the individual. These players usually have the rim contact on their lower lip such that the lower lip doesn’t vibrate with as much intensity as the upper lip. Speculating, I would think that rolling in the lower lip for very high placement players could assist them with keeping the vibrating surface on the lower lip minimal. “Medium high placement” embouchure types are still downstream, like very high placement players, but they use the opposite embouchure motion. The lower lips on these brass players looks similar to very high placement players, but there may be more of a tendency for the lower lip to roll in to ascend with these players. Donald Reinhardt’s embouchure type III would be an example of a medium high placement embouchure type that is distinguished by it’s lower lip roll when ascending. Tommy Dorsey was supposed to belong to the type III embouchure, as was Reinhardt. 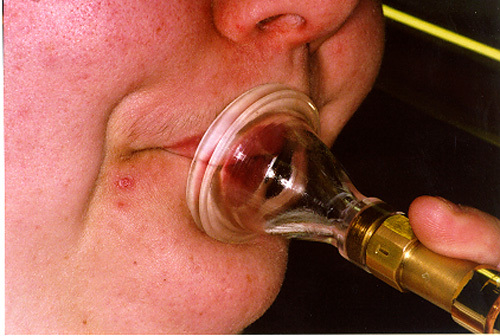 In Doug Elliott’s film, “The Brass Player’s Embouchure,” he shows video of Dave Steinmeyer playing into a transparent mouthpiece and even though Steinmeyer wasn’t classified by Reinhardt as belonging to the type III (if I recall Doug’s story correctly), he still has a very prominent lower lip roll when he ascends. Speaking of embouchure films, Lloyd Leno’s film is one of the best places you can go to observe the lower lip with some different brass players. What’s so nice about Leno’s film is that it was shot using high speed filming, so you can observe how the lips vibrate as the players ascend and descend. The photos above are only capturing the aperture at the time the photo was taken. I came across this video the other day of trombonist Matt Smith playing through an arrangement I wrote (and posted online) of Mood Indigo, by Duke Ellington. Check out his playing. He really did a good job with it, better than me. You can hear my recording and download a copy of the music here.